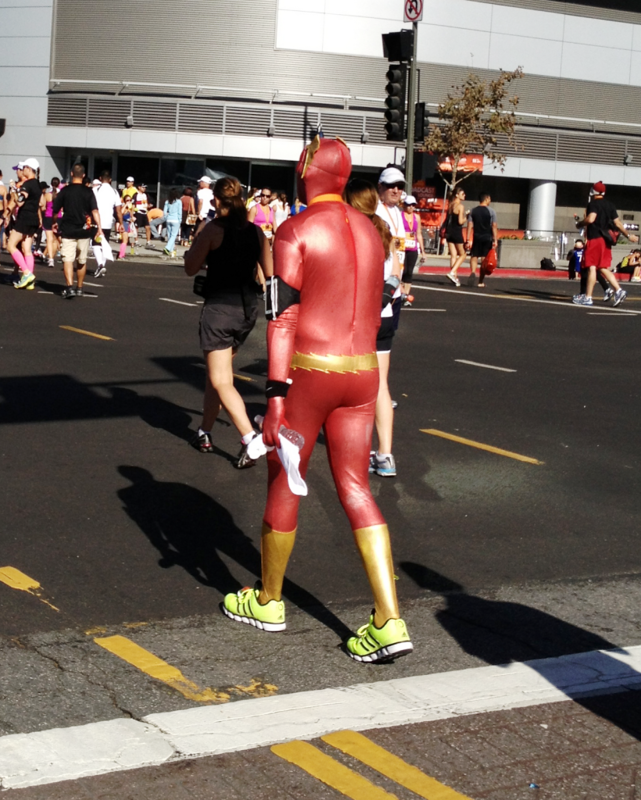 The most popular costume at the Rock ‘n’ Roll Halloween LA half marathon, hands down, was a tutu. They came in all colors and sizes and I saw them on fast runners, slower runners, men, women, heavy set individuals and Skinny Minnie’s. Other people were more creative with their costumes, dressing as superheroes or Disney characters. I got into the Halloween spirit by dressing as a runner. This dude had to be hot. It was 85 at the finish! 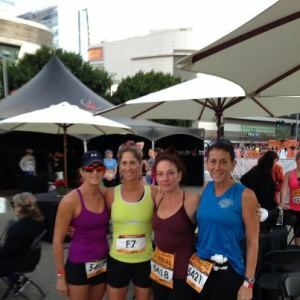 I used this race as a gauge of post-operative fitness leading into the California International Marathon. Studying the course profile prior to the race, I knew that the course would dictate my pace and that a steady effort and even splits would not be possible. My plan was to run fast on the down hills and maintain a solid effort on the up hills. A further potential difficulty was the small elite women’s field, of which I was the slowest runner, and finding a running partner. I knew there was a distinct possibility I would get caught in no man’s land and run the race alone. Shortly after the gun went off, my fear of a solo effort were allayed when another runner engaged me in conversation. Runner: What are you planning on running? Runner: I want to run 1:15, but let’s run together. Me: Sounds great! What’s your name? Runner: Taos. Like the city. We reached the first mile in a very rapid 5:30ish and the second mile in about 5:45. Our conversation continued then. Taos: Wow that was really fast. Me: Don’t worry. We have to turn around and run back up this thing! Taos: Oh, I didn’t think about that! Needless to say, pace dramatically slowed. After reaching 5k in a swift 18:05, we retraced our path back up the road hitting the next 5k in 18:55, and the big hills hadn’t even started yet. Mile 6 to 7 was a terrible grind and I was elated to finally make the turn and start another downhill section. On the course profile, there is a tiny little bump around the turnaround at mile 9.5. In my mental preparation, I thought, “how bad can this little blip be?” When we rounded the corner and the bridge came into view, I realized that the tiny bump was not so tiny. I grunted my way over the bridge and was very happy to make the turn back down. The only place I faltered was from mile 11 to 12. It was uphill, and my legs started to tire. Taos pulled away from me, but I decided I would use the downhill on last mile to try to catch back up, which eventually I did, until he dropped me with a few hundred meters left. Thanks for the pacing, Taos. Rock ‘n’ Roll does a most impressive job with their races. 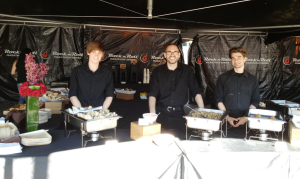 The aid stations were well stocked, well placed, and well managed. The parking situation in the morning was seamless. I went for a post-race warm down jog on the front part of the course and witnessed the clean-up operation. Trucks were on hand to remove cones, clean up cups and wash the street. It was done methodically and quickly. All remnants of the race were gone in a flash. The most important race feature though? Porta potties. They were everywhere. Thousands of them lined up like soldiers. No matter which way you turned, there were porta potties waiting for users, and not the usual lines of racers hopping impatiently from foot to foot looking at their watches, wondering why the person in the bathroom is taking so damn long (seriously, though, what does take so long? Reading the paper?). And, thanks to race management, I procured some VIP bands for myself, my sister and the two other people that were with us. The VIP tent provided porta potties, a bag drop, plenty of drinks, and a fantastic post-race spread. The coffee was even tasty. I ran a best time of 1:18.20. While this was a little off my goal pace, the course was hillier and hotter than I anticipated. The race did give me confidence for the marathon, though, and overall I am pleased with how the day unfolded.